The amount of money you owe to your creditors is a big part of your credit score. The credit bureaus use your debts to determine about 30% of your score. Your credit debt is more than just how much you need to pay on your credit cards; it is also your mortgage, car loan, student debt, and any other types of loans you have out. Not all creditors get a report of all your debts, but it is a good idea to assume they are listed and to take them seriously. Making on-time payments and whittling down your debts can make a big difference in the score that the credit bureaus assign you. Declaring bankruptcy can have a negative effect on your credit score. However, it can also be a means to pull yourself out from under your debts and keep your score from steadily decreasing. The bankruptcy will stay on your credit report for up to ten years, but depending on your circumstances and the type of bankruptcy that you file for, the impact of the bankruptcy on your credit can be diminished much quicker. While opening a new line of credit is not going to have as much of an impact on your score as other factors, it can still have consequences. If you open a lot of new lines of credit quickly, for example, the bureaus are going to wonder why you’re doing that. It could indicate that you are a higher credit risk, so they will lower your score a little. Over time, a line of credit ages and will stop affecting your score as much — provided that you don’t constantly add new lines of credit. Eventually, constantly getting new credit cards or loans could drop your score low enough that you will have trouble qualifying for new lines of credit, even if you are not using the ones you have. Making timely payments is incredibly important. You must make at least the minimum payments on your loans and credit cards, and those payments must be made on time. If you do not make timely payments, your creditors will notify the credit bureaus and your score will drop. Generally, you have to be 30 or more days late for your lenders to report it, but it’s best to make your payments on or before the due date. Paying a few days late may not hurt your credit score, but it can lead to significant fines and late fees from your creditors. The length of time you have had a credit line open will affect your score, too. If you have only one credit card opened six months ago, you will have a lower credit score than someone who has only one credit card opened five years ago, all other things being equal. That is why it can be hard for someone who is young to get credit established. Most places want you to have credit before they give you credit. But there are options, such as getting a cosigner or a prepaid credit card, that can help you get your credit bureau file started. What types of credit you have matters. When you have a mix of different credit types, future creditors see you as less of a risk. That’s good news for anyone who wants to apply for more credit in the future. If you have only a mortgage or only a credit card, then other companies cannot see how you would use different types of credit. 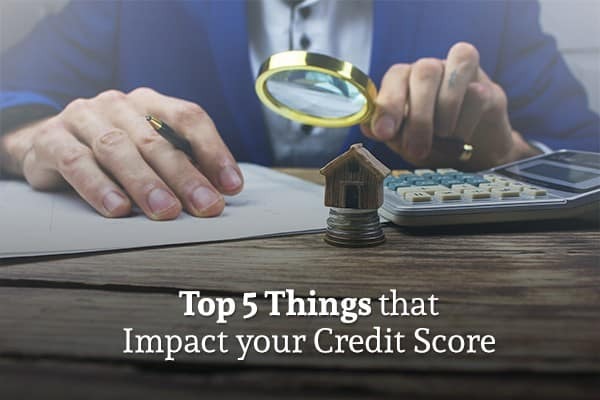 To them, that might mean you are more of a risk with those other credit types, even if you are responsible with the kinds of credit you already have. The key to having a good credit score is to use credit responsibly and have a mix of different kinds. Keep lines open and let them age so that your credit score stays high.